Releasing Lovely Little Lonely in 2017, Arizona rock band The Maine had released their most ambitious record to date, or so we thought. Throughout their career and their move into being an entirely independent band, the five-piece has consistently crafted great rock records, sprinkled with a dash of pop punk, giving them a slight mainstream edge. On You Are OK, the group’s seventh album, The Maine continues to push themselves further outside of their comfort zone, reaching further than they ever have before. Opening with “Slip The Noose,” the song includes strings, a first for the band in their 12-year career. The track still brings to the forefront their rock and roll roots, while experimenting with time signatures, creating a trippier and exciting song, challenging their fans to think differently about where the group has been and where they are going. “Numb Without You,” You Are Ok’s lead single set the pace for how the LP goes. 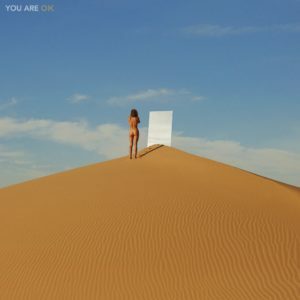 With a fast drum beat from member Pat Kirch and colorful lyrics from vocalist and front man John O’Callaghan, The Maine are writing songs that bite and cement themselves as a band that is ambitious while carving out their own little corner of the music industry, in a non-traditional manner. While the band has always had a small but loyal following, (naming their fan community 8123 after a parking garage in their hometown of Phoenix,) the group has relied exclusively on fan funding and their support, whether it’s through music purchases, merchandise, or supporting the band’s latest venture, a retail store in downtown Phoenix. You Are OK plants them firmly in the area of music where they could finally hit the mainstream, if the album reaches enough listeners. “Forevermore,” is You Are Ok’s sole acoustic track, sounding like it was written entirely on the fly, while keeping with the rawness that makes acoustic tracks from The Maine so special. With only an acoustic guitar and O’Callaghan’s vocals, new fans will get a sense of O’Callaghan’s razor-sharp sense of melody and performance skills. Tracks such as “Broken Parts,” brings back some of the punchiness of Lovely Little Lonely to the newest era in The Maine’s history, while highlighting mental health struggles that influenced the writing for You Are OK. Once again featuring strings, the band’s songwriting skills remain sharp, with a hook that could easily do well on the radio if given the chance. “Flowers On The Grave,” is the band’s longest tune to date, clocking in at nine minutes and 23 seconds. While more grandiose songs like these, can sometimes fall flat, in The Maine’s case, its perhaps is some of their best material yet. Beautifully produced and structured, “Flowers…” will certainly resonate with fans particularly if they’ve been with the band for a long time, as it shows their progression from being a small pop punk band in 2008, to a group now navigating their late 20’s and early 30’s, in the age of streaming, where their original outlet Myspace no longer runs the independent music scene. Every track on You Are OK flows together perfectly, and as The Maine continues to make music that is true to them, they will continue to perfect their brand, growing the 8123 community one listener at a time. Listen to “Broken Parts” below.